The implementation of theilslopes follows [R572]. The intercept is not defined in [R572], and here it is defined as median(y) - medslope*median(x), which is given in [R574]. Other definitions of the intercept exist in the literature. A confidence interval for the intercept is not given as this question is not addressed in [R572]. [R572] (1, 2, 3, 4) P.K. Sen, “Estimates of the regression coefficient based on Kendall’s tau”, J. Am. Stat. Assoc., Vol. 63, pp. 1379-1389, 1968. [R573] H. Theil, “A rank-invariant method of linear and polynomial regression analysis I, II and III”, Nederl. Akad. Wetensch., Proc. 53:, pp. 386-392, pp. 521-525, pp. 1397-1412, 1950. [R574] (1, 2) W.L. Conover, “Practical nonparametric statistics”, 2nd ed., John Wiley and Sons, New York, pp. 493. Plot the results. The Theil-Sen regression line is shown in red, with the dashed red lines illustrating the confidence interval of the slope (note that the dashed red lines are not the confidence interval of the regression as the confidence interval of the intercept is not included). 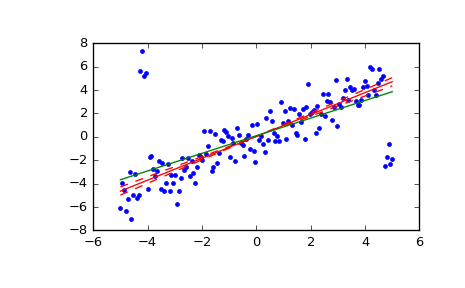 The green line shows the least-squares fit for comparison.